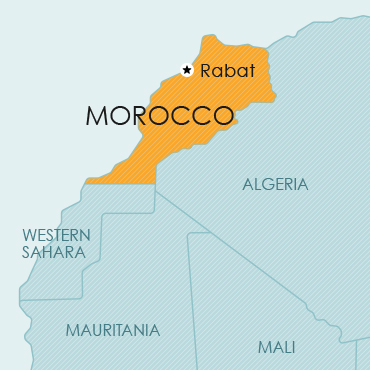 Morocco is an independent monarchy in the northwest corner of Africa, comprising Tangier, Western Sahara (formerly the Spanish Sahara), Ifni and Tarfaya. The Kingdom of Morocco was previously, until 1956, divided into three zones, namely a French zone, a Spanish zone and an International zone of Tangier. These zones have now been united into one kingdom. The fishing ports of Ceuta and Melilla are still Spanish municipalities. Morocco is a member of the Paris Convention, the Madrid Agreement and the Madrid Protocol, and the WTO/TRIPS. Morocco is also a member of the Nice Agreement. Provision is made for the registration of trade marks for goods and for services, as well as for collective and certification marks. Trade mark applications may be filed as national applications, claiming convention priority in terms of the Paris Convention when appropriate; or Morocco may be designated in international applications filed in terms of the Madrid Agreement or Protocol. Morocco is a member of the Paris Convention, the Budapest Treaty, the PCT and the WTO/TRIPS. Patent protection is obtainable by way of a national application and convention priority may be claimed in appropriate circumstances, or by way of a national phase application under the PCT. Patents of addition may be obtained for improvements or amendments to the principal patent. The Law in Morocco has not yet been amended to incorporate rules regarding the PCT system. However, PCT applications are being accepted and processed by the patent office. Morocco is a member of the Paris Convention, the Hague Agreement and WTO/TRIPS. Design protection can be obtained via national filing in Morocco. Design protection can also be obtained by way of an international registration in terms of the Hague Agreement, designating Morocco. Morocco is a member of the Berne Convention, the WIPO Copyright Treaty, the WIPO Performances and Phonograms Treaty, and the WTO/TRIPS. drawings of garment industry designs. Protection shall be independent of the mode or form of expression, quality and aim of the work. Plant breeders’ rights can be obtained under the above Moroccan laws. Morocco is a member of the UPOV Convention for the Protection of New Varieties of Plants. Protection can currently only be obtained for 76 listed kinds of plants. Although further varieties can, in principle, be added to the list, it seems that this is a difficult process.